So continues our series chronicling the stories of former NCDA players. Today we have Paul Hillebrand of Grand Valley State University telling his story. Paul played at Grand Valley State University from 2006-09, and 2013-15, a total of six seasons in the NCDA, all of which resulted in National Championships. Please take some time to read this highly detailed account of Paul’s dodgeball career prior to going to college, his time in the National Collegiate Dodgeball Association, and how he has stayed involved in dodgeball after college. I started playing organized dodgeball in 2004 as a junior in High School. 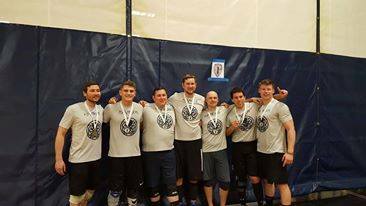 My friend formed a team to play in a foam dodgeball league at an indoor soccer facility called High Velocity Sports in Canton, Michigan near where I grew up. We gave ourselves the hilariously original name of “Ball Busters”, had pink uniform shirts made, and beat down a bunch of much older teams to win the league championship. I still remember the incredible joy I felt playing competitive dodgeball for the first time. I was hooked and continued playing in the league basically year round until finishing high school in 2006. While my teammates (like most normal people) were mostly done with dodgeball after graduating, I wanted more. I found out that Grand Valley State had a dodgeball club and I am not embarrassed one bit to admit that it was a significant factor in my decision to attend college there. 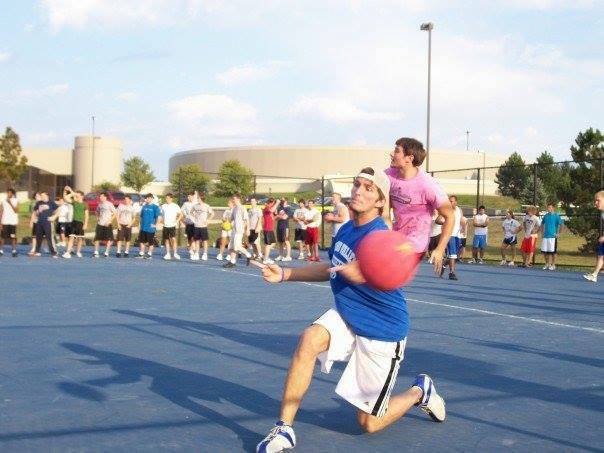 My first ever Grand Valley Dodgeball practice took place on a massive outdoor basketball court and was attended by over 200 students in the fall of 2006. It was overwhelming. I had been one of the best players in my high school foam league, but now I was trying to throw these enormous rubber balls, and I was getting caught an awful lot. It made me feel somewhat better that most of the other people there were on the same boat as me, but there was also a handful of people throwing harder than I had thought would have been possible for that huge ball (by pinch throwing or “gorilla gripping” as we used to call it). On top of this, I was told that there were 60 players returning from the previous year’s club. After leaving that first practice, I remember thinking to myself that I probably wouldn’t be able to cut it on this team, but that maybe I could still play dodgeball if I could get some guys in my dorm together for an intramural team. I am extremely happy that I ignored these doubts and continued going to practices and chose to join the club. Practice numbers dropped as the year went on, but club membership was still well over 80 people for the first semester. It was not unusual to have more than 60 people at a regular practice, we would often have to split up into 3 teams. I improved and learned a lot thanks in large part to the leadership of Club Captain, President, and Founder Dave Soukop. As my game improved, I became more comfortable on the court and dodgeball again became every bit as fun as it was when I started playing foam ball. In spite of my growth and increased confidence, I still never imagined that I would be able to make the varsity team that year, thinking this could be within reach in future years if I improved and older players graduated. I was joining a motivated Grand Valley team that had fallen one point short of winning the previous year’s National Championship in a game that was also the first time they had ever seen someone pinch a dodgeball. Grand Valley returned it’s entire 20 man varsity roster from that season. 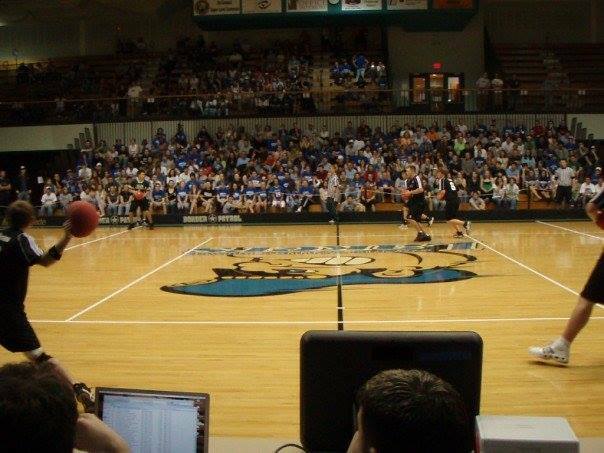 I was on the JV team for our first game of the season against Michigan State, which was a memorable one for two reasons: 1) It still holds the record for largest margin of victory in NCDA history as GV defeated MSU 16-0 at the GVSU Fieldhouse Arena. 2) It was played in front of a crowd close to 1000 people. I was amazed at how many fans there were and surprised by how lopsided the game was. One of our star players Brock Walsh (the dude who hit the camera in that one viral video) legitimately had 10 head-shots that game. It must have been brutal for MSU. I give them credit for playing out that entire bloodbath of a game in front of a large, hostile crowd. In the early years of the NCDA teams didn’t play nearly as many games as they do now, so we didn’t have another game until the Michigan Dodgeball Cup the following semester. I was surprised to learn that I had made the varsity roster for MDC. I still remember getting chills reading the email that Dave Soukop sent out the night before the tournament. I imagine much of the text of the email would look silly if read today. But for those named to that roster, coming from our Captain, nothing in the world could have motivated us more. For those that do not know me, I am a pretty non-violent guy, but when I read the words “When you get out there tomorrow, just f__ing kill someone”, you had better believe I was ready to do just that and then some for Dave. We won the tournament, facing a more difficult test in the final against Delta College, who managed to take a point off of us before succumbing. Comcast actually filmed and broadcast the tournament and there is still really good quality footage of all the games on YouTube for anyone interested in seeing what College Dodgeball looked like way back in the day. We played another home match against Delta that we won fairly easily in front of another large crowd and we headed into Nationals at Michigan State with a 4-0 record. Though we handled every team we had played up to that point with relative ease, we still worked very hard in practice in the lead up to Nationals, driven to avenge last year’s National Championship Game loss to Ohio State. I was thrilled to just be named to the varsity roster, though I knew I would again be coming off the bench. Day 1 resulted in three fairly easy wins, but it was fun to play against teams from other states like DePaul and Kent State. The following day we rolled through the quarter and semi finals to set up a showdown with 2 time defending National Champs Ohio State. We came out on top, managing to win the last couple points after it had been tied at halftime. I don’t remember too many details of the game other than the feeling that I had when time expired and we were National Champs. My second year at GV saw my future Elite Dodgeball teammate Kelvin Koster take over as captain for Dave Soukop. We had another outstanding year as a team, going undefeated and only really coming close to losing once the whole year. In spite of our team’s success, this was definitely my worst year as an NCDA player. I still managed to make every varsity roster this year, but I failed to crack the starting roster. In my early years, I was a one-dimensional thrower on a team where everyone threw 65+ miles per hour. Though I did throw a bit harder in those days than I do now, this alone was not enough to set me apart at a club whose JV team was still better than over half the teams in the league. GV steamrolled through the regular season and headed into 2008 Nationals at Ohio State undefeated. After winning our first two Saturday games with ease, we had our final round robin game with in-state rivals Delta College. One of the memorable moments of the game occurred at the end of the first half when our best player Mike Zimmer found himself alone facing 6 or 7 Delta players. When he managed to battle back to make it a one on one (this was not unusual for him), I felt confident that we were going to win the point and take a 2-0 lead into halftime. I was even more sure of this when the last Delta player (having sold out to make an unsuccessful throw) found himself in no-man’s land 5 feet away from Zimmer, one of our hardest throwers. Zimmer got even closer as he stepped into his throw (at this point I remembered thinking that this kid was actually going to die on the dodgeball court) and then…the kid somehow caught a 70 mph throw from a foot away. I’m not sure if anyone, even the Delta player, understood what happened in that moment, but then the entire OSU rec center went ballistic. The catch tied the game up at 1-1 at half time and Delta rode that momentum to make it a 2-1 game in the next point. We managed to tie the game up with about 20 seconds left to send the game to overtime which we won relatively easily. It was exciting to have such a close game against a really quality team in Delta, who really were an impressive program in the early years of the NCDA. 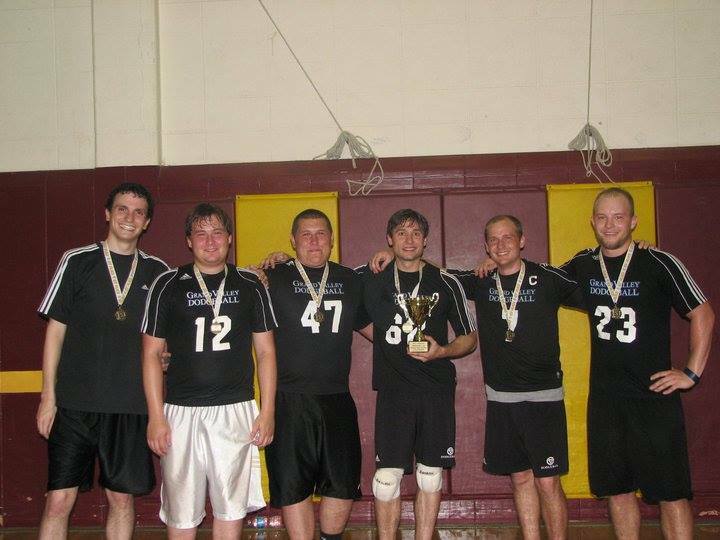 In spite of being a small community college and having their dodgeball program fold two years later, that team was the best college team we had faced to that point. Several of their players went on to star at Central Michigan and Saginaw Valley and win National Championships. Tournament Sunday was fairly anti-climactic for us as we had little trouble reaching the finals to face host team Ohio State, who had knocked off Delta in the semi-finals. We defeated OSU in the finals 9-1 and were back to back champs. During the summer between my Sophomore and Junior years, I put some thinking into adjustments that I could make to become a better dodgeball player. I bought knee pads and committed myself to becoming a better catcher, a part of my game that I hadn’t focused on much prior to this. I began working on an overhand pinch throw, which I found to be more accurate than my previous side arm throw. And spending the summer with my parents, I also returned to play in the foam ball league where I first played dodgeball. This was fun and also helpful. I feel strongly that playing different kinds of dodgeball is beneficial to a player’s development and I know that it was for mine. I returned to campus in the fall of 2008 with an increased level of confidence as a player. Instead of turning away from or dodging my teammates’ fearsome throws, I was squaring up and going for the catch. At first I dropped a lot of balls, but as the year went on, I was making more and more catches. I cracked the starting lineup and was actually able to have an impact on the results of our games, to the extent that this was possible for any one player on a team that went the whole season without allowing a point to an opposing team. Saginaw Valley was by far our closest competitor this year and they took us to our last player in points of two separate games, but our captain Kelvin was on a mission to ensure that we didn’t give up a point. We completed the “perfect season” on our home court for Nationals, breezing to a finals win against SVSU in which the only drama consisted of whether we would give up a point. The 2009 season saw my fellow senior Jimmy Stokes take over as team captain. I ran for and was elected Vice President of the club. One of the things I was proudest to have accomplished as VP was proposing and implementing weekly “tournament practices” which still continues at GV to this day. For those not familiar, this involved 4 players serving as captains drafting teams of players and playing a mini intersquad “season” with record keeping. The winning teams used to get shirts, I’m not sure if they still do. My good friend Greg Trippiedi and the rest of the E-Board was helpful in making tournament practices a reality. We did less of a good job picking the now infamous “blueberry” women’s soccer jerseys we wore that year, but that’s another story. On the court, our team had lost more players from the past year to graduation than we had in any season up to that point. This was evident in our shaky opening game at home against Saginaw Valley in which we gave up 2 more points than we had the entire previous year in a chippy 3-2 win. We won a few other games against weaker teams to close 2009, before opening 2010 by traveling to a tournament at Ohio State. This tournament featured our first matchup of the season with rising powerhouse Central Michigan. CMU had been a promising, but forgettable team up to this point, but suddenly had a bunch of athletic, hard-throwing players this year. CMU jumped out to a 2-0 lead at halftime that we were able to come back from for a 3-2 win, but the Chips had made their presence known. Another notable thing that happened during this game was that I broke my hand during the (old) opening rush of a 2nd half point. At the time, I didn’t realize it was broken and kept playing even though I couldn’t really hold the ball with my right hand. I somehow was still able to make a few catches and at one point I actually was subbed in to a point in a tight game against Ohio State. I remember telling captain Jimmy Stokes that I physically couldn’t hold onto or throw a ball, but he said he still wanted me in the game to try to make a catch. Though I wasn’t able to make a catch, it was still quite a compliment from him. Due to the broken hand, I was out for 6 weeks, which included missing the Michigan Dodgeball Cup. I was still able to travel with the team and watched Central Michigan break our streak of 4 years without a loss. As disappointing as this was, this proved to be a blessing. Our team had gotten complacent and losing gave us the motivation we needed to put in the effort that was necessary to win a 4th straight National Championship. I was able to return from my injury in time for Nationals at Bowling Green. However, I did not yet have the hand strength to pinch the ball. Fortunately, I was able to contribute on our run to the final against Central Michigan by making catches. The National Championship was a close, back and forth game against CMU that we managed to pull out by a final score of 2-1. There was really a sense of satisfaction from going out on top against a great team that had beaten us earlier in the year. It was a fitting end of an era for a group of dodgeball players that I was privileged to have been able to play with. After graduating, I remained in the Grand Rapids area, living with former teammate Greg Trippiedi and his brother Mark. I continued to attend Grand Valley practices with them, but there wasn’t much other competitive dodgeball out there that first year after graduating from GV. I was introduced to the Grand Rapids Sports and Social Club (GRSSC) by my former GV teammate Renato who had played in it. It was in GRSSC where I met my “dodgeball husband” Tony Stumpo and also played on the same team as my wonderful wife Stephanie (we didn’t meet there, we had been dating for a bit and she just realized that she had better take an interest in dodgeball if the relationship was going to work)! Steph is a very supportive fan who travels to almost all of my tournaments. She is very loud and vulgar during games, but it always comes from a place of love. Though GRSSC was fun and introduced me to some good people and dodgeball players, it really didn’t provide the level of competition that I had grown accustomed to through playing in the NCDA. And there really wasn’t much else out there to compensate for this. There was the then-annual Detroit Cup foam ball tournament and some NADA foam tournaments in Chicago, but not much other truly competitive dodgeball in the Midwest at this time. Into this void stepped Glen Spejcher. We met at a pinch tournament that Glen hosted in Chicago in June of 2011. I joined his team at the National Dodgeball League’s World Dodgeball Championships in Las Vegas later that summer and in 2012. Though it has gotten a bad rap lately, I really enjoyed playing in the NDL those two years. It was a cool opportunity to play against great players from all over the country (and a couple of other countries). Though NDL was a good experience for me, I must say that Mark Acomb’s Elite Dodgeball blew it out of the water. From the first two Elite tournaments I attended in Chicago in 2012 and 2013, it was quite evident that the league would be a game changer in terms of the dodgeball landscape. The summer 2013 tournament was especially great as it was the first one to feature a separate “pinch” division in addition to the (no-pinch) open championship. Shortly after this tournament, I returned to school at GVSU to get my Master’s of Social Work. Naturally, this meant playing for the GV Dodgeball team once again. A lot had changed in the NCDA since I had graduated with my bachelor’s degree. GV was no longer winning games 16-0. Though the rest of the league had closed the gap considerably with GV, we still had some great players. This included my old roommate and reigning NCDA MVP Mark Trippiedi as well as a couple guys who were freshmen when I had graduated, Kenny Bacchus and Dylan Fettig. However, most of the team consisted of (very talented) young guys I hadn’t played with before, including Captain Kevin Bailey. A final difference was the significantly higher number of regular season games we played. We played more games after the first semester than I had in any full season for GV in undergrad. At first it was a little weird being the oldest guy on the team, but this feeling soon passed. It was a blast to have another opportunity to play in the NCDA. We managed to remain undefeated heading into the 2014 Michigan Dodgeball Cup, where I experienced my first ever loss as an active GV player to a quality Saginaw Valley team, which was an odd feeling. But it was again a blessing in disguise, just as losing the MDC in 2010 had been a motivator for the team to work hard before Nationals, as captain Kevin Bailey also made some smart strategic adjustments during the lead up to Nationals as well. At Nationals at Ohio State, we made it to the National Championship game by defeating a very talented James Madison team in the Semi-finals 5-0. We then knocked off Saginaw Valley 3-2 to win my 5th National Championship in what I thought was going to be my final game as a GV dodgeball player. Considering the higher level of competition compared to my first four years, I think that the 2014 National Championship team may have been the best team in Grand Valley Dodgeball history. I feel crazy for saying this considering that the 2009 team did not give up a point all season. All of those old GV teams were also ridiculously talented, so that should put the earlier statement in context. Regardless of what team was best, I was incredibly fortunate to have been able to play with so many fantastic players. There were far too many to mention all of them. 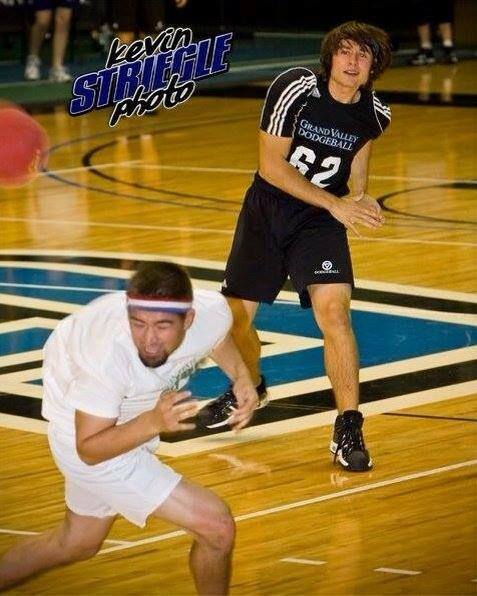 Though I wasn’t close to the best player on any GV dodgeball team I played on, I was proud to have worked hard enough to have made at least some difference by making timely catches and being a team player. 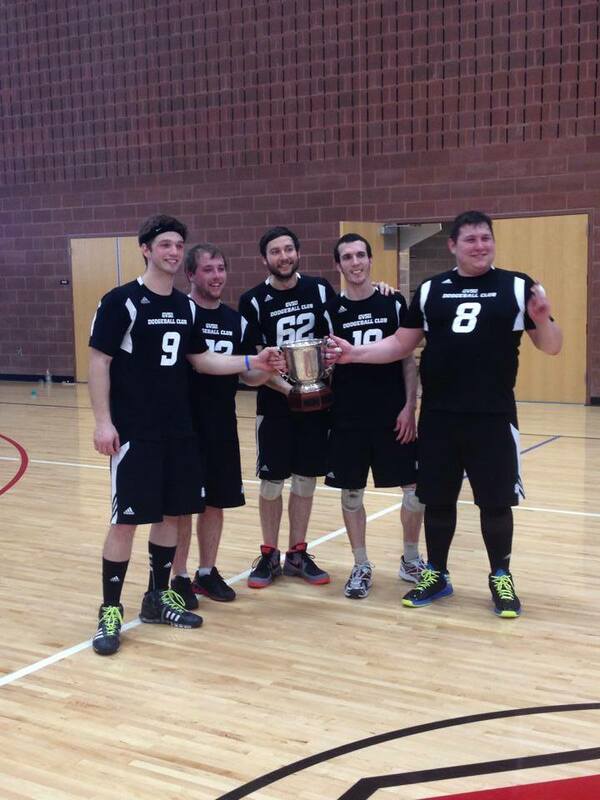 I returned to being a fan of GV Dodgeball for the 14-15 season in spite of still having one more year of grad school. I was married, busy with grad school and work, and 27 years old. I watched GV roll to an undefeated record to start the season and reclaim the MDC in February. Around this time, I started to get the urge to start playing again. I was back to playing in the local social league, but it wasn’t the same. My wife, the wonderful woman that she is, understood when I explained to her that I needed to return to the team for one final Nationals tournament. I began attending practices shortly after the MDC, just in time to make myself eligible to be on the team for a tournament at Central Michigan that March. This was a bittersweet tournament. I was thrilled to again be able to represent GV Dodgeball, but the tournament also resulted in my 2nd career NCDA loss as a formidable CMU team took us down on their home court. Yet again, a loss before Nationals provided motivation for Grand Valley heading into Nationals. Practices took on an increased level of intensity as Nationals at Western Kentucky University approached. Kevin Bailey and club leadership again made the right strategic adjustments and we were able to avenge CMU 2-0 in a close and well played final game for my 6th National Championship at Grand Valley. There has never been a better time to be a competitive dodgeball player than the past 3 years. Between Elite, UDC, and various local events, I have been fortunate to have access to quality dodgeball on a weekly basis even after completing my NCDA career. I suppose I can take some credit for this, as I have been helping coordinate weekly pickup dodgeball games through Grand Rapids Dodgeball (look us up on Facebook) for several years now, but I couldn’t do it without the help of others in our local dodgeball community, especially Tony Stumpo for helping and showing up every week so that we have a quality game. I have also been fortunate to be able to play for some great teams in Elite Dodgeball over the years, representing Bear Jordan and Grand Rapids Kraken. Just like my career at GV, I have benefitted from playing with some truly incredible dodgeball players younger and older, mostly from GV, but a few from rival NCDA schools. Speaking of the NCDA, I am still a huge fan. I go to the MDC and all of Grand Valley’s home tournaments and stream everything else. It has been awesome to watch the league come as far as it has competitively and geographically. It also helps that the team I root for wins Nationals every time. I want to thank Kevin Bailey and Jake Leski for encouraging me to write this, I enjoyed reflecting on my dodgeball career and the people and experiences that made it what it was (even if the readers enjoyed it less). I am grateful for my time in the NCDA as it was a blast, helped me to make some lifelong friends, and still proves to be a fun thing for me to follow as a fan. But I hope that others realize as I have that there is a whole world of dodgeball out there and you don’t have to stop playing just because you finished college. Amazing story. Ruth & George.